Can the Runner use Patchwork to play Sure Gamble with only 3 in their credit pool? I don't see much reviews on new cards recently so I decided to write one and also this is my first review so I hope this could provide some insights to players out there. First of all, I myself instantaneously become the fan of Patchwork after it's first release and we already see how @CodeMarvelous piloted a deck on his stream to success without CV + zer0 but Patchwork as the core engine. One thing to note is, Patchwork is essentially a 2 credit econ engine at the cost of a card. But fear not if you are thrashing the cards that you do not want to use at that particular moment or you are simply trashing your heap breakers. Therefore, one could expect to have their investment to be returned within 2 turns for 2 triggers of Patchwork, that's a very fast recovery of investment! In addition, Patchwork turns every dead card / tech cards that do not work into a "Click: 2 credits" card. That would mean you have essentially no dead card in your deck! Moreover, if your ID is Gnat, that would mean you can quickly achieve your ID's ability to trigger a 1 credit gain every turn. SWEET ! There are many more to go on the list but I'm listing out the most common ones that we see play. You can imagine how many credits are saved and we treat it as free credit gain if all of the econ cards are used alongside Pathwork's ability. Want to fancy some tricks on top? Slot your unicorn as Levy and see the value party rolling again. 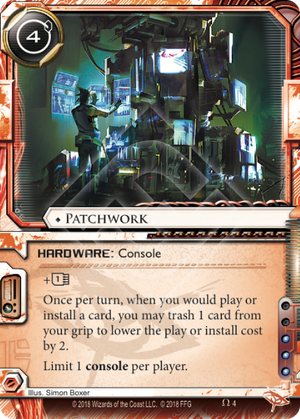 However the cons of Patchwork is that it's a 3 influence hardware and is hard to splash outside of Anarch due to the cost to play is to thrash cards and only Anarchs LOVE to do that. Other factions would almost always want to keep their hand full of options and that's a big turn down if any card was simply thrashed for play / install cost reduction at the cost of 3 influence. Unless the deck is consistently drawing and doesn't care thrashing own cards, I don't see any other faction would want to play Patchwork. Perhaps that would mean Patchwork will only see play in Anarch decks only in the end. All in all, it's super decent and I expect Anarch econ engine is still strong going forward.